Camaro "Some Wildhorsepower Out In The Barn"
Highly Detailed Small Logo of the first generation 1968 SS Camaro on the front left hand side chest of this Tee, and with the Western style scripts “Some Wild Horsepower Out in the Barn” in the background. The script colours phase from Yellow to Orange along with western style pin striping. We have here two generations of Chevrolet Camaro on display, parked up in a “barn” themed scenario. Starting from left to right, we have the 1968 SS Camaro Coupe fitted with the old school style ‘Cragar’ rims with white stencilled lettering on the tyres. This model is equipped with vinyl roof, “bumble bee” stlye racing stripes across the nose cone, and the cowl induction hood. Very well detailed in terms of the chrome trim and badge work. Alongside the ’68, we have here the Red 1969 SS Camaro convertible Coupe. This beauty is equipped with the vacuum actuated headlight window covers, the imitation rearward facing chrome hood vents, the “bumble bee” style racing decals on the nose cone, and those beautifully styled Chevrolet Rallye Rims and White lettering Goodyear tyres. The SS performance package consisted of a 350 or 396 cu in V8 engine and chassis upgrades for better handling and to deal with the additional power. The SS featured non-functional air inlets on the hood, special striping, and SS badging. Lastly, is this beautifully presented second generation model, the 1971 Z28 Camaro Coupe, in standard factory trim, from the full length front chrome bumper bar, lower grille indicator bezels, 5 spoke style factory mag wheels, and those menacing Black Racing stripes alongside the hood. The scale and detail is brilliant and accurate. The background of the Tee illustrates the bold brilliant colours of a country Barn in an evening scene, with overgrown greenery, and the images of the car manufacturers badge emblem scripts on the walls of the Barn. 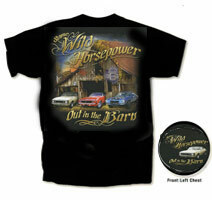 The colour of the script “Some Wild Horsepower Out in the Barn”, phase from Yellow to Orange along with western style pin striping, across the back of this T’shirt. 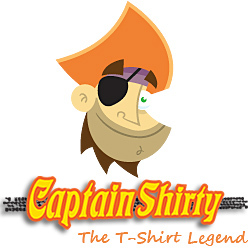 T’shirt shirt Colour: Available in Black only with Genuine GM Official merchandise Tags.